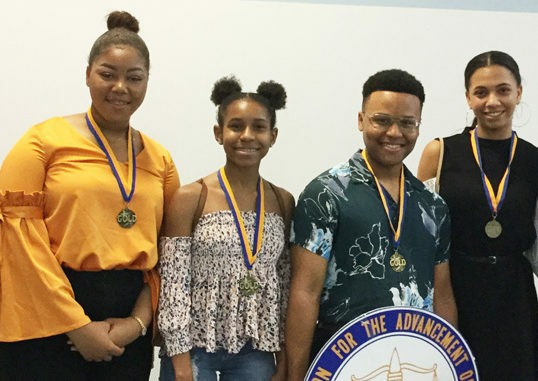 The Annual NAACP’s Afro-Academic, Cultural, Technological and Scientific Olympics also know as (ACT-SO), held its competition on Saturday, April 7th at Douglas Anderson School of The Arts. Some of the brightest most talented students competed in areas of dance, vocal, instrumental, dramatics, and visual arts. 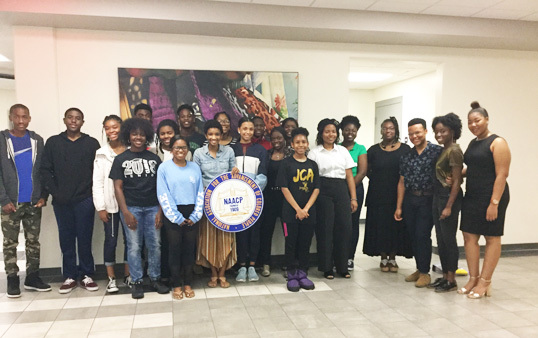 The gold medalist will compete in the NAACP National ACT-SO Competition in San Antonio, Texas. All placing students received ;laptops and tablets in addition to monetary awards ranging from $1,000 – $2,ooo. The students received all expense paid trips to compete after placing in local competitions. The ACT-SO is a yearlong achievement program designed to recruit, stimulate and encourage high academic and cultural achievement among African-American high school students. ACT-SO was founded in 1978 by journalist Vernon Jarrett to promote and award academic achievement. Competition winners receive medals and scholarships. Shown are winners Samantha Nelson (Vocal Contemporary/Douglas Anderson), Ashari Cicero (Modern Dance/Douglas Anderson), Jessica Scott (Contemporary Dance/Douglas Anderson), Chandler Bryant (Dramatics/Douglas Anderson), Kemari Colbert (Painting/ Baldwin), and Alexia Taylor (Wriiten Poerty/Ribault).